In spite of being a common problem, it is difficult to define Dizziness precisely. Different people experience different types of symptoms during Dizziness. Some feel light headed, some feel giddy, some experience vertigo and so on. Dizziness is a sort of head discomfort. It is often difficult to ascertain the main cause behind this discomfort. The most common factor that leads to Dizziness is any kind of problem in the inner ear. The inner ear contains a fluid which helps in maintaining proper balance of the body by sending appropriate messages to the brain. At times, circulatory disorders, ear infections or head injuries disturb this fluid which leads to Dizziness. In most of the cases, the causes are not serious and the problem tends to disappear or decrease on its own or with little help. 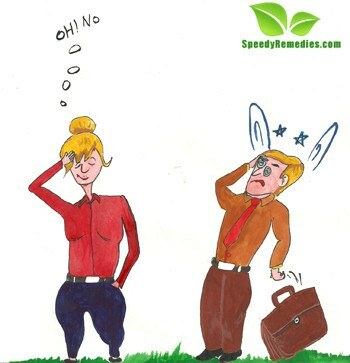 Still, natural home remedies for Dizziness can be extremely beneficial in reducing the symptoms and providing relief, especially when the underlying cause is known. The most common causes of Dizziness include variations in the blood pressure, whether high or low, heart problems like heart attack, variations in the heart rate (whether high or low) and weakened heart muscles, metabolic disorders like dehydration, low blood oxygen and low blood sugar, endocrine diseases and brain related problems like tumors, strokes, migraines, hyperventilation, and dementia. Anti seizure drugs, sedatives and certain blood pressure medicines can also contribute in causing Dizziness. Other factors include emotions, old age, flu, anemia, orthostatic hypotension, hemorrhages, infections and prolonged bed rest. Certain psychiatric conditions like panic attack, anxiety and depression may also result in Dizziness. The symptoms of Dizziness vary with the underlying cause. The most common symptoms are nausea, vomiting, cramping, lightheadedness, weakness, tiredness, confusion, loss of balance, facial numbness, dry mouth, head ache, vision changes (such as blind spots or tinkling lights), chest pain, ringing in ears, shortness of breath, and a tingling sensation in arms and legs. These symptoms could be present individually or in combination. At times, Dizziness is accompanied by vertigo, that is, a spinning sensation. • Prepare a mixture of lemon extract, black pepper, a pinch of salt and water. Drinking this mixture serves as one of the most popular natural home remedies for Dizziness. • Taking a mixture of one tablespoon of honey mixed with one teaspoon of apple cider vinegar is a tried and tested home remedy to prevent as well as cure Dizziness. • Add grated lemon, orange, lime and tangerine peels in yogurt. Taking this yogurt is an easy natural home remedy to heal this problem if it is caused by Sinus. • Drinking chamomile tea acts as a natural cure to reduce dizziness. • Drinking a cup of boiled milk mixed with about three basil leaves is one of the simplest natural home remedies for Dizziness. • Take 10 pumpkin seeds, 10 almond seeds, one tablespoon of poppy seeds and two tablespoons whole grains and soak these ingredients in water overnight. Grind these ingredients in the morning to make a fine paste. Add one tablespoon of ghee and two cloves in a cup of milk along with the previously prepared paste and boil it. Drinking this mixture on a regular basis is regarded as a highly beneficial natural remedy for the treatment of this disease. • Take one cup of water and mix equal amounts of salt, vinegar, mustard and pepper in it. Taking this mixture is one of the highly recommended natural home remedies for Dizziness. • Soak coriander seeds and approximately 5 grams of Indian Gooseberry (whether in the form of fruit or in the form of powder) overnight in a cup of water and strain it in the morning. Consuming this mixture is considered a successful natural home remdy in the treatment of Dizziness characterized by nausea. • Lavender oil and peppermint oil with their therapeutic properties are excellent natural home remedies for Dizziness. A head massage with these oils helps to improve blood circulation. Plant oils also useful in curing the problem as naturally as possible. • Acupressure is another successful way to cure this problem. Generally, most of the cases of Dizziness are the result of dehydration. Therefore, drinking plenty of water and a variety of fruit and vegetable juices help to maintain healthy water levels in the body to keep it hydrated. In addition to this, one should make an effort to include more protein in the diet. Taking a nutritious and healthy diet is beneficial in the treatment of Dizziness caused by malnutrition or Anemia. As for preventive measures, abstain from smoking, tobacco abuse, alcoholism, tea, coffee and other such beverages. Restrict the consumption of sugary items, especially in case of Diabetes as it results in increased levels of sugar in the blood and leads to poor blood circulation which in turn causes Dizziness.